Once Halloween comes and goes, parents often are reminded it’s not just the spooky holiday that presents our children (and us) with sugary treats. The reality is that many celebrations from October through the New Year are accompanied by sugar, sugar and more sugar. It’s the added sugars in soda, cookies, cakes, and some fruit drinks that can make anyone reach for seconds or thirds and have a negative impact on our children’s taste buds (they don’t call it a “sweet tooth” for nothing). These same foods also tend to also be high in calories and low in other valuable nutrients. Note: added sugars are the kinds put in foods during processing and manufacturing, not the natural kind found in fruit and dairy. While you can’t control what is being served when you attend a holiday party or get-together, you can control what you offer guests at your own home if you are hosting. That’s where this yogurt parfait bar comes in. As the registered dietitian foodie Mom in my family and group of friends, I try to find balance between the sugar and sweets that everyone craves during the holidays. So instead of baking a batch of Christmas cookies or fudge, I opt for presenting holiday guests with things like this yogurt parfait bar. There’s familiarity in the set-up: chocolate chips, gummies, broken candy pieces, you name it. 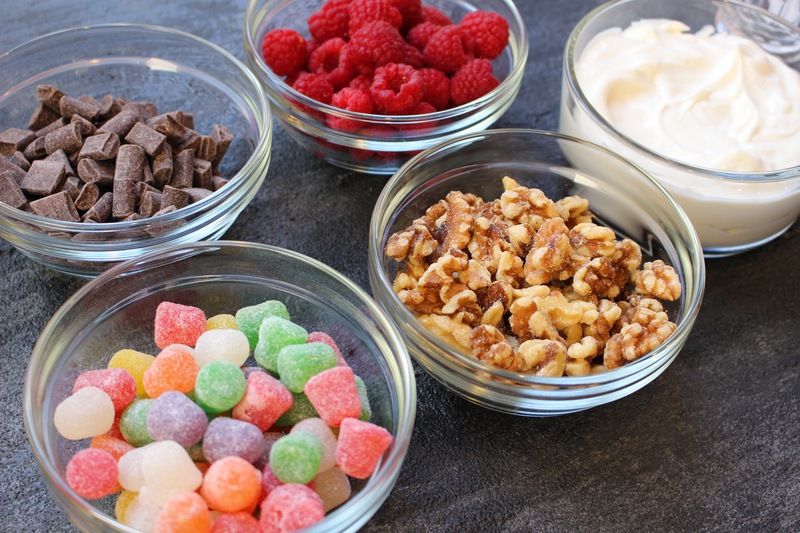 But there are also the healthier toppings: fresh fruit, low-fat yogurt, and nuts. Instead of serving foods that are low in nutrients and high in added sugar, I like offering healthier choices, such as fruit — a naturally sweet carbohydrate-containing snack that also provides fiber and vitamins that kids need. Keep dishware and utensils at one end of the table and food sections at the other end so the flow of the yogurt bar remains cohesive. When it comes to choosing yogurt, give guests two options: a classic, plain Greek yogurt and a traditional fruit-flavored Greek yogurt. 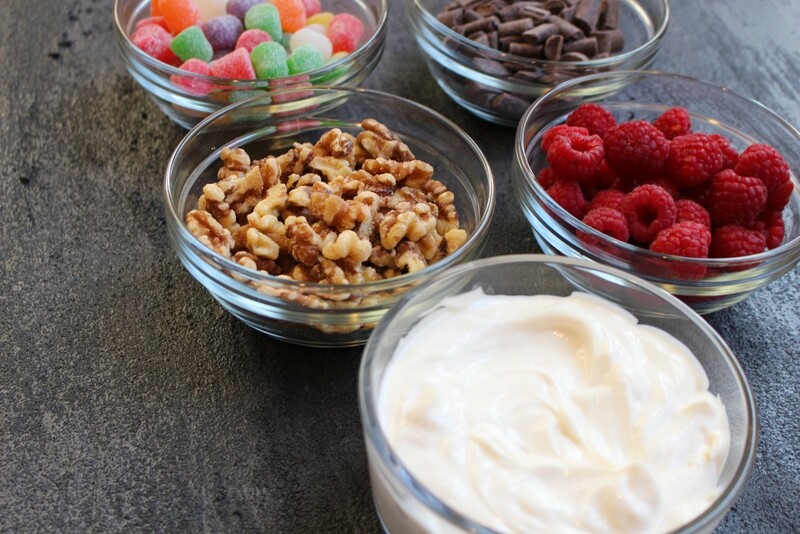 Greek yogurt is full of extra nutrition and has a thick and creamy texture. Have guests build parfaits in clear glasses so the colors and textures of each parfait shine through! A little sugar, particularly if it’s in a food that provides other important nutrients [like yogurt or whole grain cereal] isn’t going to tip the scale or send your child into a hyperactive sleep refusal. But leading by example and purchasing foods with little or no added sugars will hopefully help you and your family make smarter eating choices throughout the holiday season and beyond! Put all ingredients in separate bowls, and display on your table. Cover and refrigerate until serving. 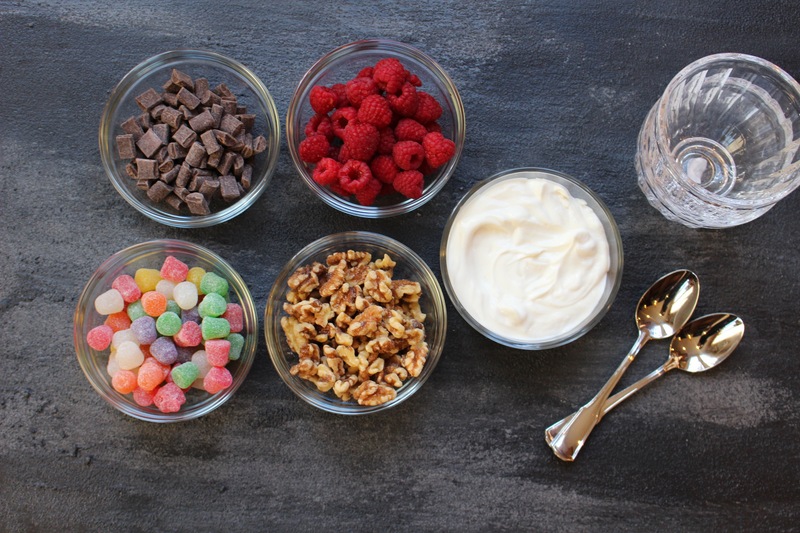 You can use any fruit, cereal or candy to make your parfait bar. Consider purchasing plastic parfait cups from a party store for easy cleanup. Katie Serbinski is Mom of two boys under two and a Registered Dietitian from Detroit, Michigan. She’s the founder of Mom to Mom Nutrition, a healthy food and lifestyle blog where she share her “me time” with other health-minded parents. On her blog you’ll find simple, family-friendly recipes, tips for new moms, and realistic nutrition advice. Through Mom to Mom Nutrition, Katie shows her readers that raising a healthy family is achievable, even when you have a toddler throwing food across your kitchen table and a baby wanting to nurse around the clock.